What jewellery do you give someone at a birth or communion? What does the perfect engagement ring or wedding ring look like? With which jewellery do you give a lasting memory of a loved one? Have you ever considered that most milestones in life are celebrated with an appropriate piece of jewellery? Just think of the traditional engagement ring or wedding ring, for example. But traditional jewellery is also gifted at a birth or communion. A nice golden necklace for a girl, a cool watch for a boy, these are just a few of the possibilities. Irrespective of whether it’s traditional or not, you certainly also want to be original. The jewellery you give to someone, or receive yourself, should be worth admiring! So allow yourself to be inspired by traditions from back then to a number of unique current ideas for every milestone. Which gift is given for a birth? There isn’t a milestone as unique as becoming a mum for the first time! However, a number of new customs have appeared between your own birth and that of your first child. Nowadays the men go for a drink to celebrate and welcome that little miracle into the circle of family and friends. Something which didn’t happen 30 years ago, but these days it’s a well-established custom in all layers of the population. The creation of new customs and habits often results in older traditions disappearing. How many new mums would seclude themselves with their newborn for 40 days these days? And how many of us still have a long white christening gown, which has been passed down from generation to generation? It goes without saying it’s absolutely fine for things to be that little bit trendier in 2018. However, there are also plenty of traditions which managed to withstand the test of time. This includes, for example, the giving of sugar beans. This custom dates back to the Romans. They would also give people beans, covered with a layer of honey, when a baby was born. Other traditions have become somewhat more nuanced over the years. Like the tradition of a silver birth spoon. It used to be customary for grandparents to give their grandchild a silver spoon, in order to wish them a rich and healthy life. The silver spoon was replaced by a silver bracelet at a later stage, which would usually have the name and date of birth or christening date engraved in it. What would you say to pimping this custom a little bit? Why not slide an engraved golden bracelet onto that little wrist. And surely those new mums can spoil themselves a little too? Or perhaps even start a new tradition! Give yourself a beautiful golden necklace with your child’s birthstone. After all, every month is represented by a different birthstone. Surprising and unique! What gift do you give a communicant? A next milestone in our lives is the first communion. Nowadays this is often replaced by the spring festival, but this doesn’t mean it’s celebrated any less. And it goes without saying gifts form part of this too. Women who are around 30 years old now, would usually have their ears pierced as a communion gift. How about you? So why not make this a tradition within your own family? Nowadays having your ears pierced is a much quicker and less painful process than it used to be. And completely safe where any possible contamination is concerned, as a new disposable and sterile machine is used for every child. The old shooting system is sometimes still used too. You can ask your jeweller for more details. Is the girl going to have her ears pierced for her communion? Then take a good look at the extensive range of golden earrings! Are you looking for something a little more special? Then why not have a pair of customised golden earrings made? Do you really want your gift to be a big hit? Then work on your own design together. Allow the communicant to put together an ideas board with inspiring photographs and drawings of what she likes. Definitely highly recommended for a formal communion! And what would you say to giving someone a golden necklace with a personalised pendant? Not every girl in class will be getting a golden necklace with her name in diamonds. This will definitely result in plenty of extra cuddles and you will instantly be given the title of best mum, sister, aunt or godmother! And what about the boys? Boys often aren’t interested in getting their ears pierced until they are teenagers and start to rebel. And whether or not they’re ‘allowed’ is often not even up for discussion .. But they would definitely be able to appreciate a beautiful or cool watch. Irrespective of whether it concerns a first communion or a formal communion. The next milestone to be celebrated and confirmed with a piece of jewellery is the marriage proposal. And this is something you, as the woman, will only need to wait for. Or not? It goes without saying you want your future husband to give you the perfect engagement ring. 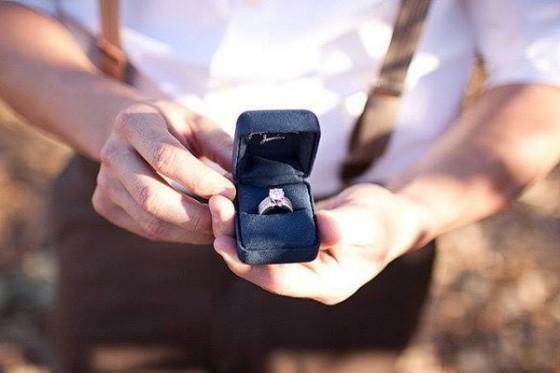 How can you subtly let him know which engagement ring you would like? Did you know the engagement ring tradition is centuries old? Even though the first diamond engagement ring was given to Mary of Burgundy in 1477 by the Archduke Maximillian of Austria, we know the symbolism of love represented by the engagement ring was already established with the ancient Egyptians. But the ancient Egyptians appeared to already be quite happy with a piece of metal wrapped around their left ring finger. Fortunately Maximillian and Mary introduced some changes here. After all, an engagement ring is not an engagement ring without a real diamond. The range of diamond engagement rings is therefore incredibly extensive. Perhaps even a little too extensive for your future husband. He will be confronted with lots of rings, which all look alike to him, whilst you have an eye for detail. So do make sure you drop some hints in relation to your personal style and preferences, if you suspect he is soon going to be asking you to marry him. After all, your engagement ring is something you are going to be wearing for the rest of your life. Of course it may well be the intention for your engagement ring to be a surprise for you, but you will naturally be the one wearing it. You therefore need to be sure you can combine the ring with other rings, golden bracelets, earrings and your favourite golden necklace. Therefore be sure to tell him which type of gold is your favourite. And whether you prefer a white or coloured diamond. Once you’re engaged and you have yourself a beautiful engagement ring, it’s time to start planning your wedding. And choosing wedding rings naturally forms part of this too. The time that this was a simple yellow golden band with each other’s initials and the wedding date engraved in it are now well and truly behind us. Your parents may well have had a ring like that, but these days people are opting for something a little more unique. This means the wedding ring can’t always be distinguished from an engagement ring or an ‘ordinary’ ring. But it will definitely be exclusive! Do you want to be sure your wedding ring is truly unique in its kind? 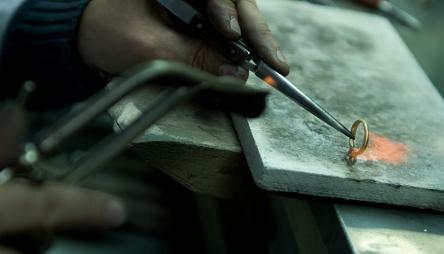 Then opt for a handmade ring based on your own ideas. Your girlfriends will be bursting with jealousy when they see your tailor-made ring. You are also no longer tied to rules and regulations where the engraving is concerned. Thanks to modern laser technology, you can literally go wild with ideas for original engraving. So make sure you give it a personal touch. What would you say to his fingerprint on your ring? Or a short message in your own handwriting in his ring? Your wedding ring can also grow in line with your relationship and family situation in the years which follow. You could add a gem to your ring every time you become a mother again. Isn’t that romantic? How do you cherish a loved one? It’s a sad fact that not every important event in life is a happy one. There will also be times when you have to say goodbye to a loved one. Many people find comfort in the fact that they can wear something belonging to that person close to their heart. As sadness has always formed part of life, memorial and mourning jewellery have a very long history too. Did you know it was customary for a woman to wear a hairpiece of a deceased loved one around 1800? Men would opt to wear a watch chain with hair. There were even hairdressers who specialised in this. And many artists would incorporate hair in a small painting on request. If we take a look back at the ancient Egyptians again, we can also see that jewellery had an important role to play in relation to deaths, mourning and memorials. They would often give rings to the decreased as a way of bringing good fortune in the realm of the underworld. The ancient Romans also attached importance to mourning jewellery. Nowadays most people opt for a golden necklace with a medallion when they want to keep something precious close to their hearts. Contemporary and timeless. You can keep something from a loved one in a closed medallion. But you can also opt for a personal inscription to keep a beautiful memory alive. For which milestone are you looking for a suitable piece of jewellery? Allow yourself to be inspired by our blog articles about jewellery and diamonds or contact BAUNAT’s experts. Still in doubt about the perfect gift? Then a gift voucher may offer the perfect solution!